Tonight with an Italian meal I enjoyed Glutino's Gluten Free French Bread. It was a little complicated to make but worth it for a large, well-risen, crusty white loaf. It is tapioca free so has quite a neutral flavour, holds together well and would make good sandwich bread. It contains white rice flour, potato starch, corn starch, guar gum, granulated honey, salt and yeast. Pros: Good versatile, crusty white bread. Cons: Contains potato flour and is dry and very dense. I agree on the "very dense" part. 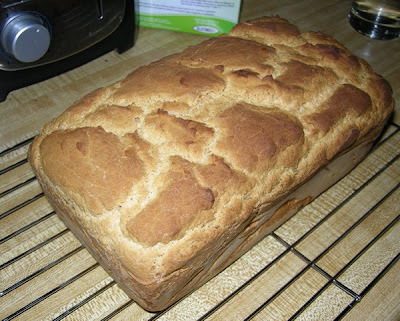 Their sandwich bread mix is much better..light and airy.